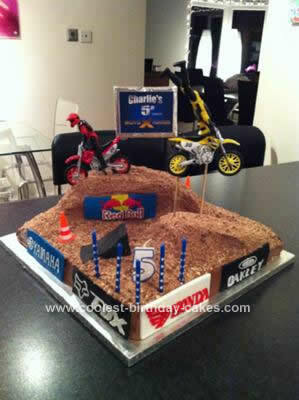 My little boy decided that for his 5th birthday cake, he wanted a ‘Redbull X-Fighters’ style birthday cake. This wasn’t something I was hugely familiar with, so I got some inspiration from various websites and compiled the things I did and didn’t like from other motocross style cakes. In order to keep it from looking like a great big pile of dirt, I thought I’d put some ‘banners’ across the side of the cake which took nearly as long as building/icing the cake, but I think it was definitely worth it! 1. In order to save time to decorate the cake, I used Betty Crocker cake mixes. I used three in all and used a 9-1/2” (24cm) square cake tin (I would think any square or rectangle tin would work fine). I used two chocolate and one marble cake mix (just to change it up a bit). 2. I then designed the banners, I rolled out a small amount of ready-made royal icing on greaseproof baking paper, used a ruler and cut out approx 12cm x 4cm rectangles. I then used a few images I found on the web and used the little icing decorating tubes you can buy from most stores (usually come in 4-5 colors). I use a toothpick to help cut the lines and stick the icing where I want it, as they tend to have a mind of their own! Again, this it quite time consuming, but I think really adds to the overall effect the cake has, so be patient, its easier than it looks! 3. I used the first cake and put it into one corner of my cake board, leaving an inch or so gap on either side. I then cut cake #2 to fill the rest of the board, again leaving the same one inch gap around the edge. I used a bit of ready-made icing to ‘stick’ them together and help keep them in place. Don’t worry too much if there are gaps or a bit of unevenness where the cakes meet as it will all be covered over with icing and ‘dirt’. I then used the left over pieces from cake #2 and most of cake #3 to make the mounds. I decided to make a little ramp with landing mound at the front with one big one at the back, again sticking together with icing. I found it easiest to make a big rectangle then cut into it to make the slopes using a bread knife. 4. Next I made the ‘dirt’. I used a mix of vanilla and chocolate cream (sandwich) cookies and crushed up in my food processor, depending on the size cake you decided to do, you don’t need that many and can always easily make more if needed. I think you could probably use just about any biscuits (cookies) so long as you have some brown and some lighter colored mixed. 5. Using ready-made chocolate and vanilla icing mixed together (it probably ended up 30% chocolate/70% vanilla), I frosted the entire cake. Again, don’t worry too much about a bit of cake showing in the icing, as the entire top will be covered with ‘dirt’. I did put a bit more effort into making the sides look smooth. 6. Next I put on the banners. I gently turned them over onto my hand and dabbed a bit of icing on them. Then one at time I stuck them to the front sides of the cake, and I also put one on the front of the big mound at the back. As the icing is pretty dry by now, you can push them fairly firmly onto the cake. 7. Next was the dirt. I found using a desert sized spoon to dump a load of the ‘dirt’ and a natural fiber pastry brush to push it around was by far the easiest way. Start at the top of the hills and work your way down. Don’t worry too much about making a mess as it is easily brushed off with the pastry brush. 8. To stick the motorcycle riders in (which by the way were probably the hardest part of bringing this cake together as I could find loads of small motorcycles but very few bikes with riders on them!) I used my glue gun to glue wooden skewers into the underside of the ‘flying’ bike (as it needed a bit more support) and just stuck a few toothpicks to the side of the wheels of the bike coming down the back mound. 9. To finish it off, I used a few chopsticks (colored black with a marker) to which I taped to a piece of foil-covered cardboard. The sign I made using Word and printed off on photo paper (to make it shine a bit more) then taped onto the foil with a bit of Sellotape (on the back). I also used a few traffic cones that we had lying around and stuck them on, really just to fill the blank spaces. I got a lot of very complementary comments from both the kids, parents and even the venue staff and passers-by where we held the party! My son, needless to say was thrilled with it! I had used the Coolest Birthday Cakes website so often in the past to get inspiration that I thought this time I would share and hopefully help someone else get inspired! I love this cake and my soon to be 4 year old has also asked for a stunt bike cake. Thank you for posting this as it has saved me! I’m going to have a good go at making this. Please could you advise me where to get hold of the stunt bikes with riders, I’ve had a look online with no joy and not sure where to look now. Looking for Ideas for my 7 year old who has just had his first dirt bike, so this is perfect, hope my comes out nearly as good as this one is fab! Thanks for sharing- great site too! Not sure if you will see this but I love this cake! Great job! I was just wondering how you did the banners? I don’t fully understand how. Did you use the pictures from the internet to stick onto the icing or did you just copy the pictures and write and draw the logos yourself with the decorating tubes? Hi Jemma- with regards to the banners, they are all fondant/icing. I chose a few motor cross logos, etc from Google images (Yamaha, Fox, Red Bull, Oakley, etc) then used ready-made fondant as the banner backgrounds (all cut to size to fit on the side of the cake) then used the little writing icing tubes you get from the grocery to freehand copy the logos. A few tips: use a toothpick to gently press in the design on the background, use a small paintbrush to put a very light dab of water so the writing icings stick better & lastly, use a toothpick again to help guide the icing where you want it to go & to help smooth down any pointy bits. Did you have colored ready-made fondant or did you fill that in with the icing tubes?